1. For a watercolour by Moses Griffith of 'Hawarden Castle' see Pennant's extra-illustrated A tour in Wales [external link] (2nd edn, 1784), p. 94/7; another, unsigned, watercolour appears in Pennant's extra-illustrated A tour in Wales [external link] (1778), I, p. 97. 2. See watercolour painting of 'Wrexham Town & Church', in Pennant's extra-illustrated A tour in Wales [external link] (2nd edn., 1784), p. 312/3. 3. 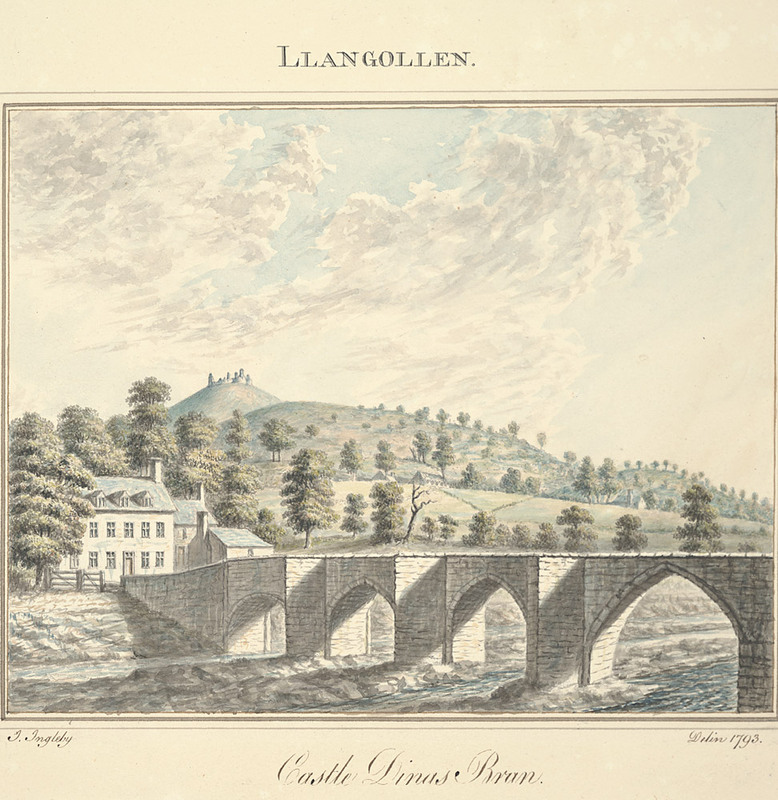 See watercolour 'Llangollen Bridge and Town' in Pennant's extra-illustrated A tour in Wales [external link] (2nd edn., 1784), p. 296/1. The bridge is mentioned in Pennant, A tour in Wales (2nd edn., 1784), pp. 296–7. 4. A watercolour painting of Castell Dinas Brân appears in Pennant's extra-illustrated A tour in Wales [external link] (2nd edn., 1784), p. 296/4. For Ingleby's watercolour 'Llangollen, Castle Dinas Bran', dated 1793, see here [external link]. 5. Two watercolour drawings of Tower are included in Pennant's extra-illustrated A tour in Wales [external link] (2nd edn., 1784), pp. 422/2 and 427. 6. For a watercolour of Eulo Castle, see Pennant's extra-illustrated A tour in Wales [external link] (1778), I, p. 84; and A tour in Wales [external link] (2nd edn., 1784), p. 87. 7. Ingleby was employed by Pennant as well as others for small commissions including the copying of coats of arms. See here [external link]. For the prevalence of small drawings of the arms of prominent north Wales families in Pennant's work see the eight-volume extra-illustrated A tour in Wales, at the National Library of Wales. 8. This list may be in Ingleby's hand. For drawings by Ingleby of views in Wales, Cheshire and Shropshire see National Library of Wales, 'John Ingleby Watercolours' [external link]; and note 5 below. 9. Richard Bull left Parliament in 1780. See 1007. 10. Britain was at war with the Americans, whose numbers were boosted in July 1780 by the arrival of a contingent of French soldiers. 11. For 'swiss views' see 1008.